This year’s imaggeo photo contest saw humdreds of great entries. Among the winning images was a stunning night-sky panorama by Vytas Huth. In today’s post, Vytas describes how he captured the image and how the remote location in Southern Germany is one of the few (in Europe) where it is still posssible to, clearly, image the Milk Way. I took the image in October 2015, usually the last time of the year when it is possible to see the center of the Milky Way at night. It is a single exposure 50mm, f/1.8, iso6400, 6s and it was shot in the north-eastern German lowlands. Light pollution is little there since it is the least dense populated region of Germany with lakes and forests and clean fresh air. Many other areas of Central and Western Europe are heavily light polluted, and decent shots of the Milky Way can usually only be done high up in the mountains. 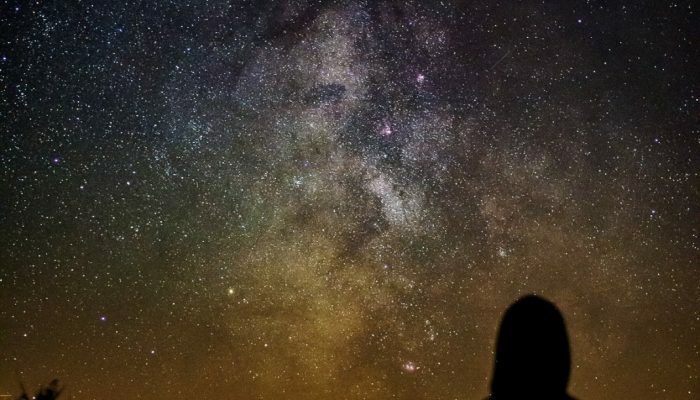 Light pollution has been recognised as a problem since the early 80s and its adverse effects of light pollution affect human health, animal behavior and ecosystem functions. However, even the area where this shot was taken is not free of light pollution, which can be seen by the orange glow at the bottom of the image resulting from nearby village lights. However, a proper amount of lighting is generally unneeded, with audits suggesting between 30-60 %. This indicates that a better managing of light not only reduces light pollution but also energy waste and greenhouse gas emissions. Last, but not least, everyone I know loves to watch the stars. Dark night skies are a cultural heritage, that man has looked upon for thousands of years, used as a calendar to prepare sowing and harvest or to navigate ships around the world’s oceans. For these reasons I believe that it is equally important to preserve dark skies as much as other elements of nature. EGU Photo Competition 2019: Now open for submissions! EGU Photo Contest 2018: Now open for submissions!